MOST of the time, gardeners’ queries pertain to fruit setting, flowering, fruit drops or poor development of fruits. At times, the gardeners get so disturbed that they are ready to remove the trees due to ‘bad performance’. There are many factors responsible for poor results of fruit-bearing trees. These could be lack of nutrition, water stress, wrong pruning, insect or disease infestation, hormonal disturbance and unfavourable weather conditions like strong winds and hail. If a tree bears more flowers than it needs, it leads to natural flower drops which becomes a cause of concern for gardeners, who feel that everything is lost. It is not so. Unless there is some serious insect or disease problem, the tree retains the flowers and the fruit load that it can naturally bear. This holds good in case of the mango tree on which powdery mildew and young crawling nymphs of the mango hopper cause tremendous flower and fruit drops. 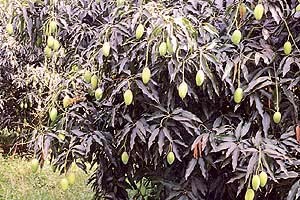 The mango trees also suffer another kind of fruit drop, the one seen during May-June. It can be checked by spraying sodium salt of 2, 4-D dissolved at 1 gm to 50 litres of water in the last week of April or the first week of May. The drift of this spray should not fall on other plants. The spray pump should also to be washed thoroughly with washing soda after the spray. Flower and fruit drops are common on the lemon plants too. They occur due to water stress or excess. Light but frequent watering of the plant should be done throughout the year, especially in the summer months. The pre-monsoon showers have provided some relief now but before that litchi trees witnessed fruit drop and splitting due to high temperature. There is the problem of overcrowding on the peach trees that can lead to limb breakage. The fruits are closely crowded on the branches and if all are allowed to mature there is drastic reduction in fruit size and quality. It also weakens the tree, affects its life span and future fruit-bearing capacity. This problem can be overcome by thinning of the fruit. 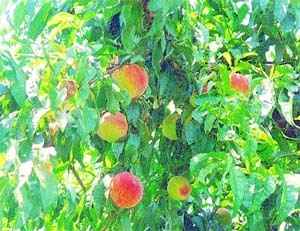 The fruit of the Pratap variety of peach can be thinned during the second and third week of March and the Shan-e-Punjab in the third or fourth week of March. Fruit-to-fruit distance on a shoot should be 10-15 cm. Shaking the fruit-bearing branches slightly rids the tree of weak fruits naturally.